Flip Out Mama: For All Cooking Mama Lovers! Camping Mama for DS Available NOW! For All Cooking Mama Lovers! Camping Mama for DS Available NOW! Check out this press release about the hot new DS Game, Camping Mama: Outdoor Adventures! Edison, New Jersey – September 13, 2011 – Majesco Entertainment (NASDAQ: COOL), an innovative provider of video games for the mass market, announced today that the latest installment in its iconic and seminal Mama franchise, Camping Mama: Outdoor Adventures, is now available for the suggested retail price of $29.99 at retailers everywhere. Rated E for Everyone, Camping Mama marks the first time in the series’ decorated past that you will be able to play as Mama’s two children. Develop your island survival skills with Mama in over 100 different stylus-based games featuring a broad range of challenges: craft a fishing pole to fish, sharpen knives and axes with stones you’ve collected, make a fire to cook shellfish you’ve caught, cook the eggs collected from captured chickens to eat, set up your camping tent to sleep in, construct a net to catch butterflies, and much more! Have fun participating in activities such as rock climbing, swinging on jungle vines, spelunking, rowing a boat, tree climbing, making s’mores and more. With customization options and collectible play, Camping Mama lets everyone go wild in the great outdoors! · Explore the camp site and island as you play a mix of stylus-based cooking, crafting, treasure hunting, and action mini-games in the signature Mama format. · Play through 38 levels with 100 brand new mini games as Mama’s son or daughter with either Mama or Papa on hand to provide guidance. · Experience nature in a variety of settings, such as the Forest, Mountains, and Seas in day, night, snow, and more! · Find treasure that you can use in further adventures, or even to decorate your camp. · Earn the highest achievement level by creating the rarest and strongest tools. · Collect insects, fish, treasure, and more, and then survey your collection in your scrap book. Aim to find everything! · Perfect mini games you’ve unlocked in Challenge Mode. 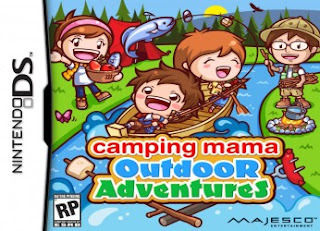 Developed by Cooking Mama Limited, Camping Mama: Outdoor Adventures for the Nintendo DS is now available at retailers everywhere. For additional information on Camping Mama or to view the recently released gameplay trailer, please visit www.campingmamagame.com. Hi there! Visiting from the BFPR Alexa group and am following you on Networked Blogs! Would love a follow back if you get the chance. Have a great day!